Dr Dan Koch (pronounced "Ko"), a longtime friend of ours from the Short North, asked us to redesign his website to highlight his awesome interior and custom line of frames (called "ColorEyes") on a new website. Columbus Eyeworks has been a staple of the Short North Community for decades, and has been an active participant in both the Short North neighborhood and Columbus arts community, as you can see when you visit their website. One of the things we like to do when designing websites to make them a little more unique, is to do more elaborate type treatments, as you can see on the homepage. It adds a touch of personality to a site, makes them stand out more than others, and certainly more than can be done with template-based websites. 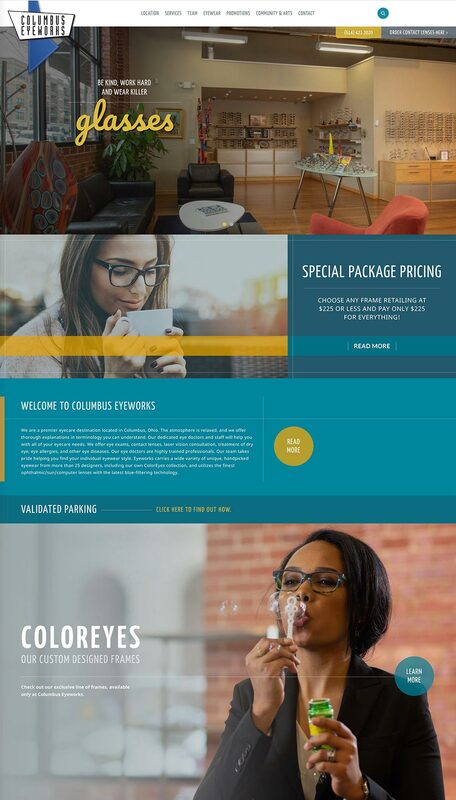 And while we also do template-based websites, which you can see here, this site for Columbus Eyeworks is a WordPress site. One of the things we've done with this site is to link their blogs to their Facebook page. So anytime they post a blog on the website, it's automatically fed to their Facebook page as a post. Social media feeds on a website.